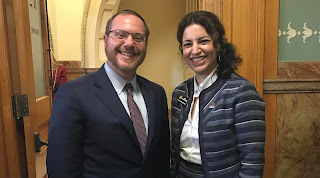 My new representative in the Illinois State legislature is Rabbi Yehiel Kalish - an Orthodox Jew. He was at one time (not that long ago) one of Agudah’s chief lobbyists. For many years. And before that he was Agudah Midwest’s chief lobbyist in Springfield, Illinois where as Illinois’ capital the state legislature is located. I know him fairly well. Rabbi Kalish was just sworn in as the 16th district representative in the Illinois House which is the district in which my home - and the homes of most of Chicago’s Orthodox Jews are located. He has replaced Lou Lang a long time powerful Illinois House member who recently resigned to pursue a career in private life. According to reports I have read, Yehiel was chosen by the Illinois Democratic Party over at least 12 other candidates. And with good reason. He is a skilled politician who made many friends there as a lobbyist for Agudah Midwest. I am very happy to say that I know him personally and I am sure he will serve his constituency very well. A constituency whose makeup is 70% non Jewish. To the best of my knowledge this is the first time a Charedi Rabbi has ever served in office here in Illinois. I take comfort in the fact that he will not only remain loyal o his Jewish constituents, but to all of us. Including the virtual ‘United Nations’ that make up much of my district. A district that has not only many Orthodox Jews, but many devout Muslims as well. At the same time, Yehiel is also close to his older sister, Dafna Michaelson Jenet, who is not Orthodox and is intermarried. He told JTA that he has spoken to her every day since the first day he took office. He seeks her advice on how to be an effective legislator. 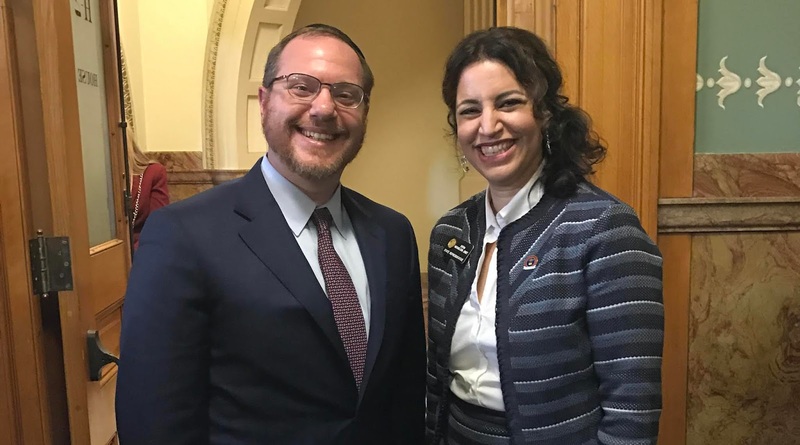 Michaelson Jenet is a Colorado state representative. It’s nice to see that someone who reveres Charedi Daas Torah can nevertheless maintain a close relationship with an intermarried sibling. Not something you would expect from a Charedi Jew, let alone a Charedi Rabbi. Perhaps this is something we can all learn from. In any case I want to which Yehiel the best of luck in his new job. I’m sure he will serve us well. Mazal Tov to him and his entire family.